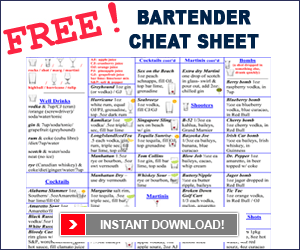 If you’re looking for an awesome and free bartending cheat sheet, you’ve come to the only place on the Net to get one. The BarsandBartending.com free bartending cheat sheet contains drink recipes for all the drinks that every good bartending needs to know. Enter your details below and we’ll email you the link to download the PDF bartender cheat sheet. There are about 60 or so drinks listed on the page. We’ve also added some cool bomb shot recipes and jello shot recipes as well as the standard and popular cocktail recipes and shooter recipes. Whether you keep it at home and study it nightly, or you keep it behind the bar to look at when you get stumped, a bartender cheat sheet is truly a bartender’s best friend. Remember that 99% of those 20 plus thousand drink recipes you see sites bragging about will never be ordered off the average bartender.